A combination of file photos shows Alain Juppe (L), current mayor of Bordeaux and Francois Fillon, a former prime minister, who lead in the first round French center-right presidential primary election, Nov. 20, 2016. Former prime minister Francois Fillon is favorite to become the French center-right's presidential candidate after a voting upset that puts him in pole position for a showdown with far right leader Marine Le Pen in next year's election. Fillon, who has said he will cut public sector jobs and rein in government spending, won 44 percent of votes in Sunday's first-round of voting for the centre-right's nomination. He faces a second-round vote against another former prime minister, Alain Juppe, who trailed him by 15 percentage points. Candidate for the right-wing Les Republicains (LR) party primaries ahead of the 2017 presidential election and former French prime minister Francois Fillon delivers a speech at his campaign headquarters, Nov. 20, 2016. Former President Nicolas Sarkozy came third and was eliminated. The outcome adds to uncertainty about the result of next year's presidential election, likely to be decided in a runoff in May. It could increase a still remote risk that the anti-immigration, eurosceptic National Front leader Le Pen can win it, although there is no clear evidence Fillon would fare worse against her than Juppe. The surprisingly big lead hands Fillon, 62, a strong advantage in next Sunday's runoff. An admirer of late British Prime Minister Margaret Thatcher, he is probably the closest thing France has to an economic liberal and social conservative. Although Fillon's triumph on Sunday was a surprise, opinion pollsters had said he made a late surge in campaigning, and several stalwarts from the conservative Les Republicains party threw their weight behind him after his first-round success. 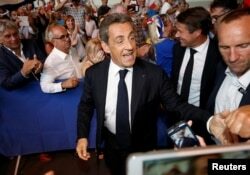 FILE - Nicolas Sarkozy attends his first political rally since declaring his intention to run in 2017 for president, in Chateaurenard, France, Aug. 25, 2016. "I will vote for Francois Fillon because it is he who will best defend the values of the right," said party president Laurent Wauquiez, a close Sarkozy ally. A snap poll by Opinionway after Sunday's results showed Fillon winning the head-to-head contest against Juppe with 56 percent of support. With the French left in turmoil under deeply unpopular Socialist President Francois Hollande, the opinion polls indicate that whoever becomes the center-right challenger is likely to face Le Pen in May's presidential election runoff. The polls have suggested Le Pen has only a remote chance of winning that runoff but the more centrist Juppe, 71, had been seen as the best placed candidate to defeat her in a two-horse race. A BVA poll in September showed Fillon, who drives racing cars for a hobby, would beat Le Pen by a margin of 61 percent of votes to 39 percent if they contest a presidential election runoff. But that consensus predates Donald Trump's U.S. election win, which exposed the same popular anger against political elites as in Western European countries such as France, Italy and Austria that Le Pen has tapped into. It also raised questions over the accuracy of opinion polls, which were under scrutiny again on Monday in France. With his socially conservative and pro-business policies, Fillon lacks the broad appeal of the more centrist Juppe, and so may increase the perceived risk that Le Pen could take power. Fillon stood down as social affairs minister after big street protests in 2003 when he championed reforms extending the age at which people are entitled to retirement pension payments. "To some extent, we believe Fillon's lead introduces additional uncertainty when it comes to the presidential election," said Raphael Brun-Aguerre of JP Morgan in a research note. But Juppe, who served as prime minister from May 1997 until June 1997 under President Jacques Chirac, would also be vulnerable to National Front barbs. "Either of the candidates would probably be targeted by far-right National Front leader Marine Le Pen being for part of the old political guard, and Juppe, on this front appears relatively more vulnerable," said Morgan Stanley in a research note. Juppe was not giving up. FILE - French Foreign Minister Alain Juppe (C) arrives at a meeting in Bordeaux, western France, March 3, 2012. "I believe more than ever that the people of France need to come together to turn the page of a disastrous five-year term that has demeaned our country and to block from power the National Front which would lead us into the worst of adventures," he told supporters on Sunday night. Fillon and Juppe have clashed most forcefully over Fillon's proposals to slash the cost of government, notably by axing 500,000 public sector jobs over five years. Fillon's proposals for market-oriented reforms — including scrapping the 35-hour working week and raising the retirement age — go beyond what his challenger advocates for a country where the state remains a powerful force in the economy, even for the center-right. "My fellow Frenchmen have told me, everywhere, they want to break away from a bureaucratic system which saps their energy," Fillon told his campaign faithful on Sunday night. 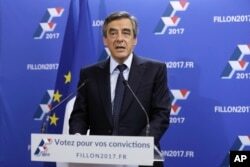 Born in a western region of France where the secular nation's catholic roots remain strong, Fillon has said France faces a problem "linked to Islam". Juppe has sought a more conciliatory tone with France's large Muslim minority. Any registered voter can take part in the conservative primaries, and polls showed many of those that did on Sunday were from the left and extreme right. 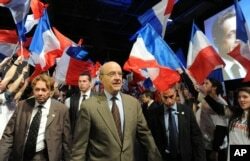 "The only chance for Juppe is a strong turnout in the second round, including from left-leaning voters. He will try to present himself as the man of the centre. His message will be: we need reforms, but nothing that is horribly painful," said Claire Demesmay, an expert on Franco-German ties at the German Council on Foreign Relations. The ruling Socialists and their allies will hold their own primaries in January. Hollande, whose popularity ratings are abysmal, has yet to announce whether he will stand again. Some on the left hope that if Fillon wins the conservative ticket, its candidates could find new impetus as a space opens up for them in the center. Another beneficiary could be Emmanuel Macron. The former investment banker who quit his job as Hollande's economy minister in the summer launched his independent run for the presidency last week. Macron, who says he is neither of the left or right, ranks as one of France's most popular politicians, though polls indicate his chances of reaching the election's second round are slim.